Thought I’d start a regular feature about the great things I find at thrift stores – starting with today’s treasures. 1) Two, brand new-in-the-original-package round silver towel bars (to replace the old-fashioned square-ish ones on my bathroom wall) — $3.93 each ($3.93 x 2 = $7.86). I’m guessing the original price would be about $15 each ($30). If you locate some thrift store bargains this week, share the joy! Write and let us know. 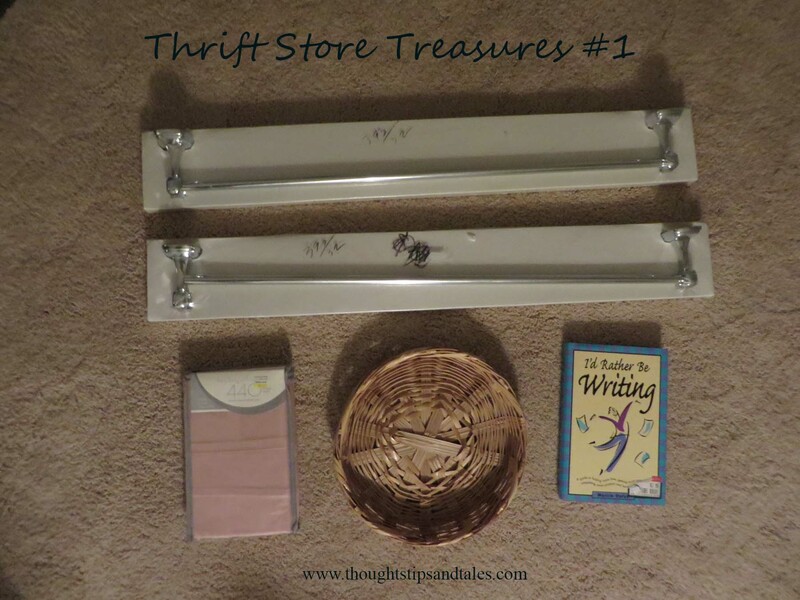 This entry was posted in bargains, saving money, thoughts tips and tales, thrift stores and tagged bargain, saving money, thoughts tips and tales, thrift stores. Bookmark the permalink. I agree about the fancy stores. Once you’ve shopped thrift stores, it’s hard to buy stuff in a “real” store! I wrote a post a couple weeks ago about vintage dishes that I found at Goodwill. I love going shopping there. I love the steals I can find at thrift stores. May just have to go look tomorrow! Goofball Mommy recently posted…The True Super Heroes- Lessons from a Four Year Old. Congrats! Nothing like a shopping deal. Ohh you were able to get some great finds. I love it when I find good deals at the thrift store! Me, too, Lysha. Really makes my day! I am the worst thrift shopped because I have zero patience! So I appreciate those that are thrifting rock stars! Way to go! I love second hand shopping, some of the best pieces in my wardrobe are from flea markets, consignment shops, etc. Me, too! When I wear some of my favorite bargain clothes and jewelry and think about what I paid for them, it always makes me feel good! Bet it’s the same with you.